Blacks headed to National Final! Saturday in the Western Semi Final the Blacks took on the Santa Fe Santos. At the half the score was 17-0 and stayed that way until the 53rd minute when Santa Fe scored their only try of the match. In the end the Blacks routed Santa Fe 36-7. In the Western final on Sunday spectators saw a brutal, scoreless first half. Finally at the 45th minute Black’s Fly Half Tane Jericevich slotted a penalty kick with another shortly after to make the score 6-0. Six minutes later Wichita scored a converted try to take the lead 7-6. The Blacks got the lead back at the 67th minute when Wing Rickey Johnson made a long break for an unconverted try for a Final score of 11-7. 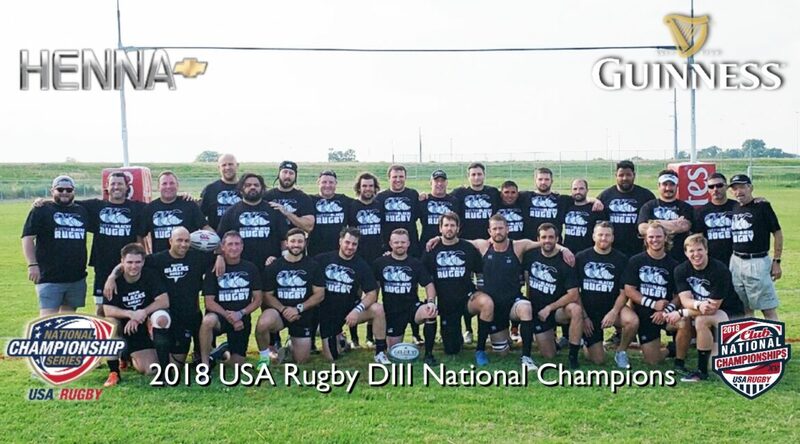 As the Western Champions the Blacks are now on their way to play for the Division III National Championship where they will meet Long Island Rugby in the final on June 3rd! The Blacks are the first club in USA history to send a 3rd side the National Final! The men’s Division I western final was played Saturday night between Belmont Shore Rugby and the Austin Blacks. Austin scored first to take a 3-0 lead in the fifth minute of play. Belmont then scored fifteen straight points including a pair of tries to open up a 15-3 lead. The Blacks then scored a try plus the conversion kick to cut the Belmont lead down to 15-10. Austin the scored a try in the 57th minute and following the conversion kick they now took a 17-15 lead.